Hundreds gathered in Charles Town Thursday, Aug. 2, 2018 to protest a new manufacturing plant being built in nearby Ranson. The plant will manufacture stone wool insulation a few miles from public schools and neighborhoods. A new manufacturing plant is being built in Jefferson County and promises to bring 150 jobs to the region. But there’s major pushback from the community. Rockwool is a Denmark-based company that manufactures stone wool insulation. This type of product is used in buildings, industrial applications and acoustic ceilings. It’s a fiber-based insulation produced from natural stone and recycled content. A year ago, the company announced it would build a second U.S. facility in Jefferson County, West Virginia. Their first U.S. plant was built in Marshall County, Mississippi. But several Jefferson County residents are concerned, because the plant is being built just a few miles from four public schools and will have a smokestack that will release a range of chemicals like formaldehyde and benzene. Decker’s sentiments were echoed by other locals as well – pointing to health concerns and environmental regulations. 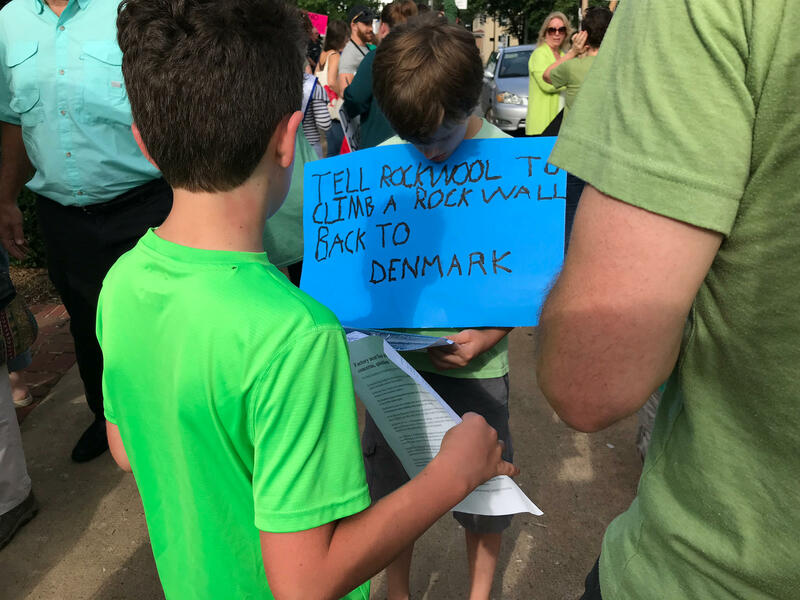 A boy protests the Rockwool company with his family on Aug. 2, 2018 in Charles Town. About two weeks ago, a Facebook group called, “Citizens Concerned about Rockwool-Ranson, WV” was created by local woman Leigh Smith. Within days, the group grew to more than 4,500 members. “We don’t want smokestacks, we don’t want industrialization; that’s not what we moved here for, and that’s not what most people want,” Smith said. 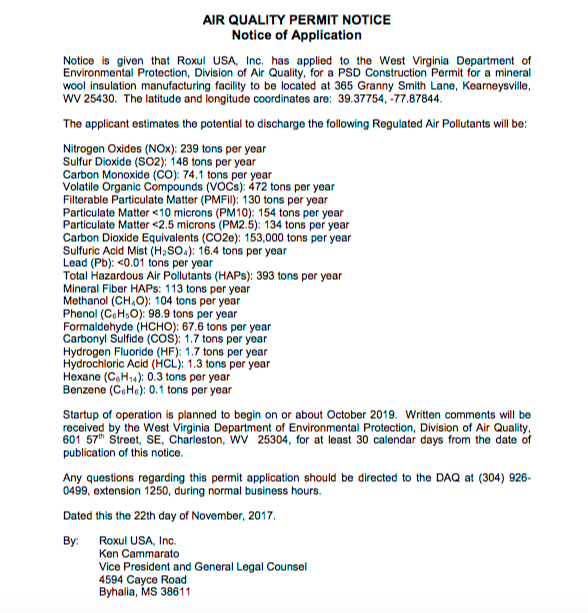 Jefferson County Commission President Josh Compton said at a recent meeting that he’s also concerned and wants the West Virginia Department of Environmental Protection to visit his community, explain the air quality permit they issued back in April and describe how the facility will be monitored. “Over the next course of days, weeks, we’re going to see what powers we actually have and what we can do to resolve this situation,” Compton said. The DEP reports there will be continuous emissions monitors on key components of the facility. They also said the facility would be regularly inspected. Air quality specialist Michael McCawley is a clinical associate professor at West Virginia University’s School of Public Health, Department of Occupational and Environmental Health Sciences. He said it’s difficult to say how much impact the chemical emissions might have over the long term, but that ultimately, it is a gamble. If weather conditions remained fair year-round, he said the chemical impact would be insignificant. Rockwool stated on Twitter that air quality is one of its top priorities and that the plume from the stacks will mostly be steam. Air quality is one of our top priorities & primary reason for constructing tall stacks in Ranson. Tall stacks improve the dispersion of the steam plume and thus reduce particulate and other matter that might reach people on the ground. Rockwool has not yet responded to requests for comment from West Virginia Public Broadcasting about air quality concerns or economic development. They did say, however, there would be a community open house at the end of August. In June, the company broke ground and is expected to complete construction by 2020.